Sally Aitken and I were at our cabin in the west Chilcotin near Tatla Lake for a week prior to the lightening storm that ignited so many fires in the east Chilcotin and the corridor from Cache Creek to Quesnel on July 7th. Along with others in the area of our cabin, we monitored the status of the fires and were concerned about being able to leave should highway 20 (the only realistic exit route) close. 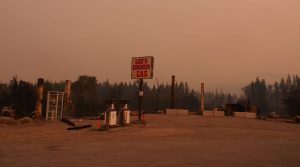 Another fire in the Kleena Kleene area to the northwest of us was threatening to close highway 20 west bound to Bella Coola. On July 8th, highway 20 was closed in both directions due to the Hanceville fire and power to the west Chilcotin went out due the Hanceville fire damaging power lines. We packed for a quick exit on July 9th and, as there were no other options, went for a mountain bike ride. When we returned from our ride in the late afternoon we learned that Highway 20 was open eastbound as an escape route, but was still closed westbound. We made a hasty exit. 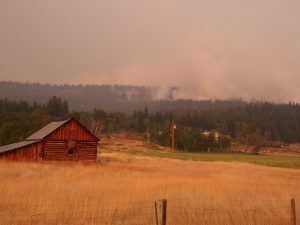 At about 8:00 pm we passed through Alexis Creek heading towards the fire. The winds were from the west blowing smoke away from us, so we had good views of the Hanceville fire on the hills to both the north and south of Highway 20. 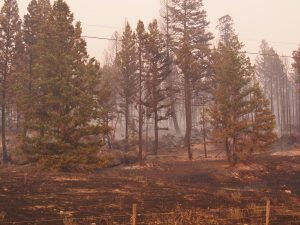 Fire crews and heavy equipment were working to put in fire guards to protect homes in the Anaham Reserve. 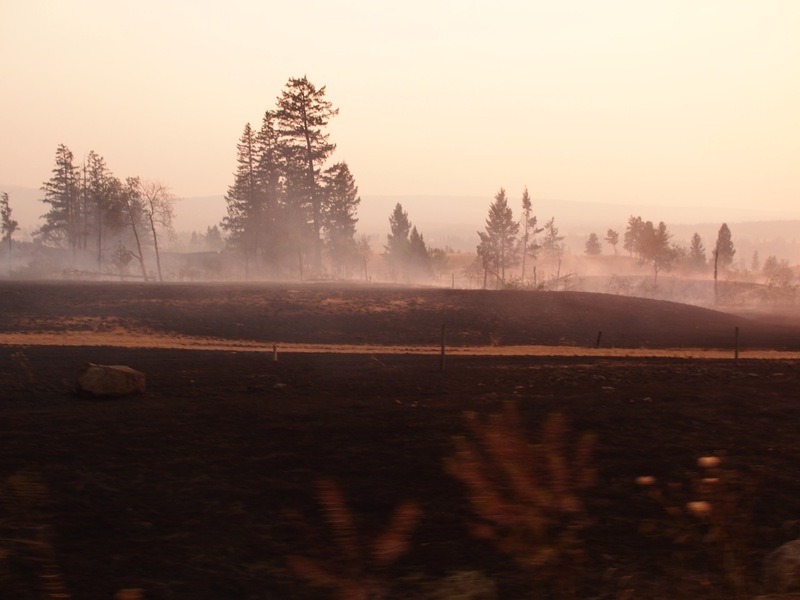 As we drove further east, the fire came closer to the road and we drove through areas that had already been largely burned, with residual spot fires that were still active. Lee’s Corner gas station and restaurant was burned down. 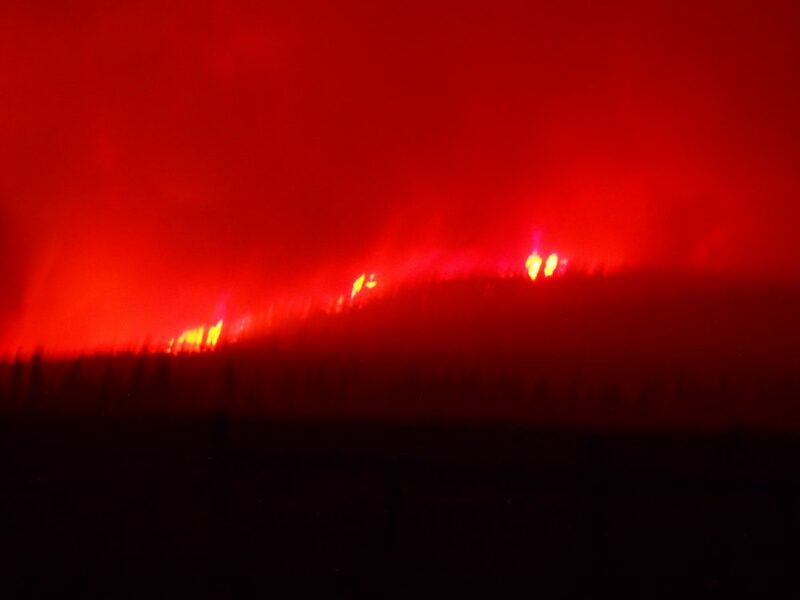 Proceeding further east from Lee’s corner, we drove into the active fire area, with burning on both sides of the road. This is where some of the video begins. Visualize for a moment a massive fire that is many square kilometers in size working it’s way through a somewhat open conifer forest and grasslands that are tinder dry. A westerly wind is pushing a plume of smoke to the east. The plume is thin on the west edge and rises like a massive wedge as you move to the east. We were driving from the thin edge of the smoke wedge into the thick edge. It got steadily darker. The fire was burning to the road edge on both sides and there was some crowning visible (for non-foresters, crowning is when the fire burns explosively through the foliage in the upper part of a tree). As it got darker the flames appeared more orange. Proceeding further east the darkness became complete and we forgot that the sun had not yet set. We saw periodic crowning, burning stems, and ground-level fires of varying intensity burning erratically on both sides of the road. Whole stands of trees in some spots had turned to red hot, glowing columns of orange light. Driving through the smoke was like driving through a blizzard. The road was only visible with the headlights on low beam and we could only see from 10 to 30 meters ahead. Several times intense fire-generated winds swept across and totally obscured visibility. Sparks and embers were common. We proceed east through the dark with the fire on either side for about 20 km (from just after the old mill at the top of the Hanceville hill to about Harper Lake). At Harper lake the smoke began to clear somewhat and the fire was further from the road. It was still very dark, but we were able to use high beam and see further ahead. Ominous glows appeared here and there through the smoke and we were very concerned that we might drive into still more of the intense part of the fire. Finally a brighter orange glow appeared ahead and on both sides. Our first reaction was fear that the worst of the fire still lay in front of us. We were relieved, however, when we realized that this new glow was daylight and we were finally emerging from the fire. Why didn’t we turn back early on? The trees in this area are not large (few over 20 m in height) and the sides of the road are cleared back some 20 or more meters. The chance of the road being blocked by a fallen tree was very small. We knew that the darkness was due to the thickening of the smoke wedge above us, and although the fire in the darkness looked frightening, it was in reality no worse than what you see in the early part of the video. We monitored the external temperature as we drove. It was about 22C as we entered the fire and increased to about 25 to 27 degrees. A couple of times it spiked to about 35 degrees and we considered turning around, but each time it quickly returned to the mid to high 20’s. As ominous as it all seemed, we were not in serious danger as long as we drove carefully and the outside temperature stayed reasonably low. So, we pushed forward and after what began to seem like an interminable amount of time, emerged on the east side of the fire. Our dog slept in the back, completely unaware of anything but the bag of treats in the glove box. Similar to a small group of cows we saw grazing in a small field, apparently oblivious to the fire all around them. The video of a small part of our drive is here. Unfortunately, perhaps, Sally was so focused on the fire she lost focus on capturing more of it on video. Priorities. We are recovering from being heavily involved in the organizing and scientific committees of Forest Genetics 2013, an international conference that brought together ~180 people from four forest genetics organizations and 22 countries. This is the third time that Sally has played a lead role involved in organizing a conference (and we both hope that it’s our last). We enjoyed the meeting despite all the work, and want to share some lessons from these experiences for those of you who may be taking on a similar task for the first time. 1. Location, location, location – if you want a good turnout, pick a location that people want to go to. 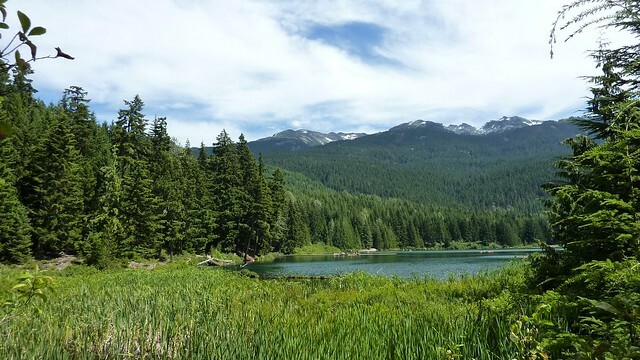 We picked Whistler, BC as in the summer this ski resort village has ample accommodation, a huge range of summer activities, and is in a mountain environment. As it is a village and not a city, there was lots of opportunity for impromptu interactions among delegates outside of the conference schedule, with people running into each other as they strolled through the village or enjoyed a beer on an outdoor patio. 2. Give people free time or they will make it – if you fill every spare minute of every day, participation in talks and poster sessions will drop off as delegates bail to go sightseeing or take advantage of available activities. The better the location, the more important this becomes. We scheduled a free afternoon midway through the conference for people to do some hiking, cycling, relaxing, or to go up the gondola, As a result, we had a full audience for most presentations. If you have to run more concurrent sessions to make this work, then do so. 3. Networking doesn’t happen during talks – Make sure that you keep sessions running on time (with brutally efficient timekeepers to keep those speakers under control who believe what they have to say is more important than the next speaker or break), and schedule enough time for people to chat at coffee breaks and meals. Otherwise, these conversations either won’t happen, or will happen in the hallway during presentations. 4. Select invited speakers carefully and save some heavy hitters until the end – Too often, conferences end with some poor graduate student speaking in a concurrent session to a group of empathetic friends squirming in a near-empty room because most participants have left before the end of the conference. You can avoid this by keeping the conference relatively short, and by wrapping up the meeting with a session of well-known invited speakers. Develop your invited speaker list with your scientific committee, and be sure to include a wide diversity of speakers in terms of age (and career stage), gender, scientific topics, etc., rather than inviting only the usual suspects. 5. Poster sessions need care and refreshments – It might seem easy to skip a poster session if you aren’t presenting, but these sessions are important to plan as people put a lot of work into their presentations and often are grad students who benefit greatly from feedback on their projects and new contacts. Adequate time needs to be allocated to these, and a free drink and snacks often provide the motivation for people to attend. Try to keep the posters available as long as possible, as most people end up chatting during the poster session and will enjoy the opportunity to sneak in at some time during the conference to quietly view the posters (or, for our introverted colleagues, to get away from the crowd). 6. Food matters – The quality of food seems to stay in many people’s minds after meetings are over, so get a foodie or two to pick items from the available menu, and don’t skimp on amounts. Make sure that you give people registering the option to state dietary requirements or preferences, and pass these on to the caterers. Vegetarians are common these days, but (being vegetarians ourselves) we find that you need to provide vegetarian choices to omnivores as well, as otherwise meat-free options disappear quickly, leaving the vegetarians with only dead animals to eat. If possible, have a different caterer and venue for the banquet than for the lunches for variety. A common problem with coffee breaks is that there is a traffic jam because there are insufficient or poorly designed stations with food or drink, and this can delay the resumption of sessions (as it did for us on the first day). Talk about this with the caterers, and insist on an adequate number of stations. Make changes if needed as the conference progresses. 7. Budgeting and payment– Budget to break even with the minimum number of people you expect to register, not the number you hope for. Develop a budget with “must have” and “nice to have” items (meals, SWAG, entertainment, free drinks, etc.). You can add items from the “nice to have” list as registration numbers climb. Include both high and low estimates for all costs and for numbers of participants as you estimate registration fees. A little “gaming” with those variables will help you determine your likely break-even point. Then budget conservatively from there (i.e., set registration 10% higher than you think it needs to be). Developing a budget spreadsheet with cost and revenue estimates with high and low estimates for attendance and costs, and that allows some easy gaming of different scenarios helps with estimates. PayPal is useful for payments, but it comes with a cost that needs to be budgeted for. You can also hire a conference management company to handle payments and many other details, and make your life easier, but for a small meeting, this will increase your registration fees substantially. 8. Conference SWAG – None of us need more cheap plastic mugs or ugly, poor quality conference bags. However, think about items that could decrease, rather than increase, the environmental footprint of the meeting. If the caterer uses disposable coffee cups or provides bottled water, then give people reusable cups or mugs and provide tap water instead. We were pleased to find a source of conference bags made of recycled street banners by a non-profit society called Common Thread employing women with various types of barriers to finding work. A portion of the cost of the bags also went to the Whistler public art fund. The bags were beautiful, unusual, and a big hit. 9. There will always be hiccups – Develop a vision and a plan with your conference committee through consensus, and then do your best to realize those plans, but accept that there will always be a few things that go wrong, and a few people that will be unhappy about something. Don’t fret about these, and don’t change your plans for one or a few highly opinionated people. Similar to planning a wedding, it’s pretty much impossible to keep everyone happy, so just do the best you can and stick to your plan and vision. I was given this advice early on by a friend and colleague (thanks, Jean Bousquet! ), and used it frequently. 10. Don’t overcommit – Think twice before you plan to speak at the conference you are organizing. You will be busy with conference details and preparing a talk may be the final straw. Instead, try to highlight your lab’s work through profiling your postdocs’ or grad students’ presentations. 11. Don’t bend to all specific requests – some delegates will seek special provisions, refunds at the last moment, want travel arrangements changed for field trips, and generally drive you crazy with requests. If the arrangements are clear, don’t be too flexible or you’ll be caught in a swirl of last minute details that can be difficult to keep track of. State the rules for refunds, deadlines, etc., clearly on the conference website and stick to them. Delegates are adults and can deal with their own issues. 12. Be cautious with fraudulent registration attempts – there are at least two types of fraud to be careful with. One is where people will attempt to get invitation letters to use to acquire entry visas to the country. They may register and pay, and seek the invitation letter under the guise that they need it to get travel approval. The second may be where people pay with a stolen credit card and then seed a refund. There are likely others. If something seems odd, look into it before you send a letter or refund. As a tree enthusiast, I have always been curious about how long-lived and evolutionarily ancient conifers have been able to adapt to their spatially and temporally variable environments. When I was a grad student at UC Berkeley in the 80’s, I wanted to study the genetic basis of adaptation of Bolander pine (a subspecies of lodgepole pine) to the ancient acidic and nutrient poor soils of the Mendocino pygmy forest in California. At that time I could either a) use genotypes for a small number of presumably neutral genetic markers (i.e., not affected by natural selection) to learn about population history and evolutionary divergence, but not adaptation, or b) study relationships between phenotypes in common garden experiments and population environments, and learn about adaptive variation in a crude quantitative genetics manner. However, for the most part we couldn’t link specific differences in DNA sequence with differences in phenotypes and fitness any more than Darwin could. Even as new genetic tools were developed, the long generation length and enormous genome size (~20Gb; 7x human) of most conifers made many genetic approaches intractable. Fast forward to 2012. As we kick off this blog, the first conifer whole genome sequences have been produced by labs in Canada, the US and Sweden. We now have sequence capture tools to reduce genomic DNA to the portions we are most interested in – the exome. Massively parallel next-generation sequencing generates mountains of data faster than bioinformaticians can analyze it, and it now costs less to sequence a base pair of DNA than to digitally store that datapoint. Finally, DNA sequencing is no longer the domain of hard-core molecular biologists – the technology has become accessible to non-molecular, organismal biologists like me (although funding remains a barrier for many scientists focused on natural populations rather than model organisms). As I had dreamed doing 25 years before, scientists at UC Davis and Cal State Sacramento recently sequenced a small number of candidate genes in lodgepole pine from in or near the pygmy forest and found variation in two of those genes putatively involved in phosphate and aluminum transport associated with pygmy forest soils. Can tree populations adapt to rapid climate change? Does gene flow between populations assist or slow adaptation to new conditions? What should forest managers and conservationists do to mitigate the impact of global warming on our forests? On this blog, we hope to explore these questions in the context of progress in our AdapTree Project and other efforts. I am fortunate to work with an amazing group of young scientists, and I learn more from them than they ever learn from me. As we all share ideas, perspectives and experiences, I hope that our readers will benefit as much as I do.